You can upgrade to Priority 2-3 day shipping for your entire seed order for 1 low price: Available for U.S. orders only. All Foreign shipments please contact us for additional shipping rates on all orders. Priority Shipping for seed orders: $6.00. These seeds are from pumpkins of 500-700 pounds. Most of these pumpkins had parents that were over 1,000 pounds. Also check out our website for other available proven seeds. 6 seeds per packet. These seeds come from pumpkins of 700 – 1,000 pounds. All seeds are from controlled crosses, with exceptional growth potential. The seeds are harvested from large fruit with genetics from some of the finest growers in the World. 3 seeds per packet. Our Premium Seed Packets! All these seeds are harvested from pumpkins over 1,000-pounds. 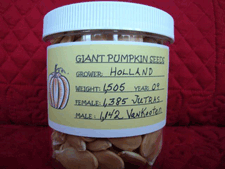 These seeds have the genetic potential to grow World Class Giant Pumpkins. 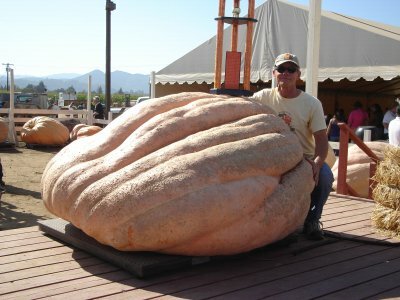 The genetics are impeccable and the results should mean many new personal bests for giant pumpkin growers. 3 seeds per packet. SOLD OUT! From our hand-selected planting stock! Single seed packages with a "Family Tree". Prices range from $8.00 - $30 dollars. A new miniature pumpkin that weighs just 4-ounces! JACK – B – QUIK is deeper orange and has better ribbing than other varieties. It is highly prolific with outstanding shape and color. Seed is treated with Captan to insure maximum germination. 10 seeds per packet. Giant Pumpkins "WORLD OF COLOR"
These pumpkins are both big and beautiful! The 50 - 125 lb. fruit are produced in peach, blue, white, pink, and dark red/orange. World of Color pumpkins are nicely shaped and will definitely create a new concept in Fall displays. 6 seeds. Early in the 2017 season I realized I had an excellent opportunity to do well. We were having a nice, warm summer with loads of sunshine. I also had some amazing seed stocks, including the awesome 2,145-McMullen, which had been a great producer of outsize pumpkins. I decided to go for it!! It is easy to go overboard, so instead of doing too much, I increased the frequency of the fertilizer application on our schedule from every 7 days to every 5 days. The concentration of the foliar sprays and the amount of Mycorrhizae, and granular products was boosted by 50%. We had a very dry summer including 55 days in a row without any rain, a new record for our area of the country. I water out of a 55-gallon tank of pre-warmed water. I would much rather have the sunshine and apply the water myself. See how everything came together to bring us to our finest growing season ever! We demonstrate virtually everything we did to grow the largest pumpkin ever produced in Washington State. Special lighting, music, titles and special effects create an awesome audio-visual experience! The DVD is 2-hours long and covers the entire 2013 growing season from soil preparation to the weigh-off and even beyond to the collection and care of the seeds, and preparing the soil for next year. We share our fertilizer schedule, our pest control strategies, and even our fungicide program that keeps our plants July fresh into Fall for great late season growth! As a special bonus, we also give FREE World Class Giant Pumpkin Seeds with our DVD packages. Check out the seed crosses on the seed stock list. This year we will include free with each “HOW I GREW THE HEAVIEST PUMPKIN IN THE WORLD FOR 2017 AT 2,363-POUNDS” DVD, a 1429-18 seed, 1,339.5-18 seed and the 633-18 seed. Value of these seeds alone is $48.00! If you already have our 2017 “2,363 DVD, you may substitute the “Seed Starting, Pollinating and Water Systems” DVD by choosing Substitute DVD from Add to Cart menu. This year we will include free with each “HOW I GREW THE HEAVIEST PUMPKIN IN THE WORLD FOR 2017 AT 2,363-POUNDS! 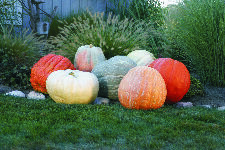 and “HOW I GREW 3 PUMPKINS TOTALING 5,146-POUNS! DVDS, a seed from our 1,649.5-18, a 1,429-18 pound pumpkin, a seed from our 1,339.5-18, a 633-18 pound pumpkin, a seed from our 1,713-16 and a seed from our 1,452-17 pound pumpkin while supplies last. Value of the seeds alone is $106.00!! THE COMPLETE PACKAGE!! 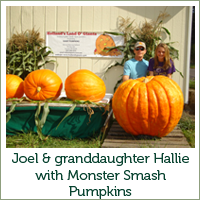 You will get our 3 DVD’s, the “HOW I GREW THE HEAVIEST PUMPKIN IN THE WORLD FOR 2017 AT 2,363-POUNDS, the “HOW I GREW 3 PUMPKINS TOTALING 5,146-POUNDS, and “HOW TO GROW GIANT PUMPKINS 2015”. You will receive 1 seed from our 1,968-18(dmg) pound pumpkin, the 1,649.5-18 pound pumpkin, the 1,429-18 pound pumpkin, the 1,339.5-18 pound pumpkin, 633-18 pound pumpkin, 1,713-16 pound pumpkin, the 1,792-16 pound pumpkin, the 1,790-17 pound pumpkin and the 1,452-17 pound pumpkin!! This offer includes 9-free World Class Seeds!! If you already have our 2017 “2,363 DVD, you may substitute the “Seed Starting, Pollinating and Water Systems” DVD by choosing Substitute DVD from Add to Cart menu or choose ADD DVD and receive it as a 4th DVD for only $12.00 additional, and receive an extra pumpkin seed as well. The value of these seeds alone is $196.00! To view a complete list of our Seeds with a Pedigree, click here or add to your cart below! 2,363#-17:(2,145 McMullen X 2,261 Wallace) - $50 A NEW NORTH AMERICAN RECORD! The Largest in the World for 2017, 2nd largest of all time!! It was a high-round pumpkin with good orange color. The pumpkin grew steadily all season and was 11% heavy. No stem cracks or problem areas. 1,968#-18: (2,145 McMullen X 2,363 Holland) - $30 A high round orange pumpkin with great parentage. It looked perfect on top, but when loading I discovered a small crack on the bottom. Went 4% heavy. 1,649.5#-18: (1,937 Urena X 2,145 McMullen) - $30 We won 1st place with this at the Elysian Brewery Weigh Off in Seattle. It was a good looking orange pumpkin that was the centerpiece for the Annual Extravaganza at the Seattle Center near the Space Needle. The proceeds from the Pumpkin Celebration go to Children’s Hospital. 1,429#-18: (2,269 Paton X2,145 McMullen) - $20 We sold this one for display. It was an attractive long pumpkin that made a beautiful display when set on end and carved for Halloween. 1,339.5#-18: (2,363 Holland X 2,269 Paton) - $20 We won 1st Place at the Washington State Fair with this beauty! This one would have grown much larger, but had to be harvested on the last day of August for the Fair in Puyallup. 633#-18: (2,261 Wallace X 2,363 Holland) - $8 We lost the first pumpkin on this plant to a split. The 663 was a late set that ran out of growing time. It was a long, wide pumpkin with good orange color.